Highly regarded in the astro-community. This eyepiece is quite "Legendary". Edited by Cygnus2112, 27 May 2016 - 02:28 AM. Gave the 24mm Pan a quick go tonight. Scope: 10" Skywatcher Dob. The mirror is really good for what it is. No coma correction was used. Here is a "brief" evaluation in less than ideal skies. Sky transparency was poor. It was a great night for planets, but not for deep sky. I was able to try out the 24mm Pan in some sucker holes and also when the sky cleared out a bit above, but more nights will be needed with better transparency. I was going back and forth from my scope with the 24mm Pan, (and other eyepieces), to a friends 10" Teeter with Zambuto Optics on the planets. Mars was incredible tonight! Eye relief: Kind of tight, but not bad at all. Forget about using glasses if you need to when observing, as the field gets cut off when doing so. Otherwise, without glasses, I found the eye relief just right. Sharpness: Excellent sharpness considering I don't use a coma corrector. It reminds me a lot of the 22mm LVW in the sharpness department. I tested it briefly on some stray star clusters. Focus Point: In able to reach focus, I had to add more parfocal rings than my XW's. Focus point was probably just under 1/2" more than what I normally use. Field Stop Sharpness: Razor sharp. Barlow Factor: Vignetting with 2 inch, 1.85x barlow, but central area really sharp. I wouldn't use a barlow with this anyways as it will get me too close to a 14mm eyepiece, and I have a 14mm Delos for that. Using with Filters: It worked fine when I used my 2" Lumicon O-III and 2" Orion Ultrablock filters on it on The Lagoon Nebula....but again, need a better night with better transparency. Edge Of Field Brightening: I could see some, but need to see if I can see it on a better night. So far, so good. Skies were not optimal at all, so I will have to get back to it again when the skies are better for a full evaluation. Edited by Cygnus2112, 27 May 2016 - 02:27 AM. Just ordered one to use with my Astro-Tech 111 and Tele Vue TV-85. You are correct, this is a legendary ocular. I have an engineer friend who has been attending the southern star party in Florida for years with his magnificant Tek telescope. I asked him which eyepiece is his favorite....the Panoptic 24. Edited by MarkGregory, 27 May 2016 - 03:31 AM. Now I am wondering......Which ocular has the better transmission? 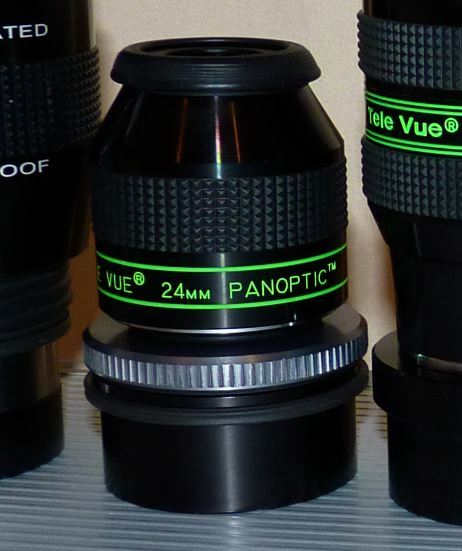 24mm Panoptic? or 22mm Vixen LVW? Nice initial report and looking forward to more. The transmission difference between the Pan and LVW will be very interesting to know. Can you please also compare the difference in tfov between the two eyepieces. fantastic EP. When I bought my Nextstar Evo I slipped this one in. Never looked back. A true workhorse. I later picked up a 31mmT5 and wondered if I would even need to 24. Lets just say it is still my starting EP for every session, and often it continues to be the workhorse. Its small size also makes it a great fit for the 2.5x powermate. That combo has delivered probably my planetary views ever. Finally ordered 2 of these for binoviewing. I tried both one evening but no sure If I did checked the transmission of each. I did prefer the 24mm Pan as I recall. The 24 Panoptic, but comparing them visually would be difficult since they would differ in exit pupil brightness by more than the difference in transmission. I don't recall trying both? No you never did (at least with me) but I did one evening a few years back. You can use it with the eyeguard rolled down, and that provides plenty of eye relief. The original cap works as well that way. Mark, Looks good. Just be sure to keep all the OEM parts "in case" you eventually decide to part ways with it. Well, I couldn't wait until this week to try out this new way of using the 24mm Panoptic, so I tried it tonight through my back window. Conditions were ok, but not good enough to go outside, so I just checked out how it felt with the rubber eyecup removed. Wow, what a difference! The 1-2mm gain in eye relief really does help a lot, and I also discovered that I can see the entire field while using my cheap reading glasses. The glasses *do* touch the housing, but they are not worth anything, so no bother there. So, when I sketch, I can do it with my reading glasses using the 24mm Pan !!!! Without the reading glasses and without the rubber eyecup, the 24mm Pan is PERFECT !!! I have that same dilemma. I prefer to view naked eye, so ER of 14-15mm is fine. But to sketch or view charts I need my reading glasses and swapping back and forth is a real pain. Good to hear about your success with the Pan 24s. 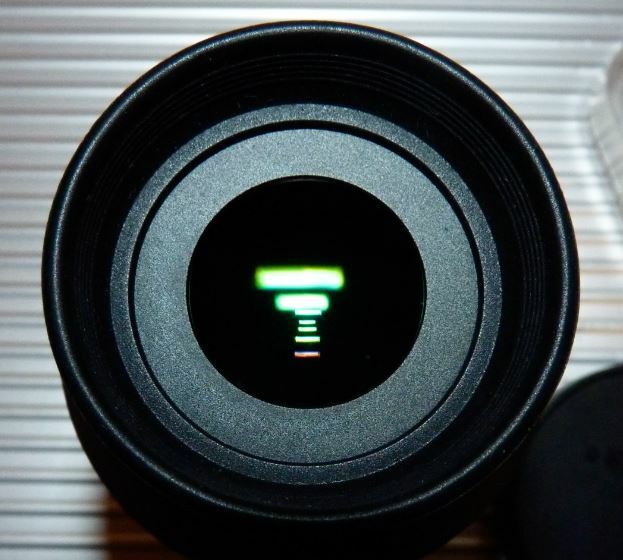 When that Pentax XW 5 arrives I will be able to test my first 20mm ER eyepiece. 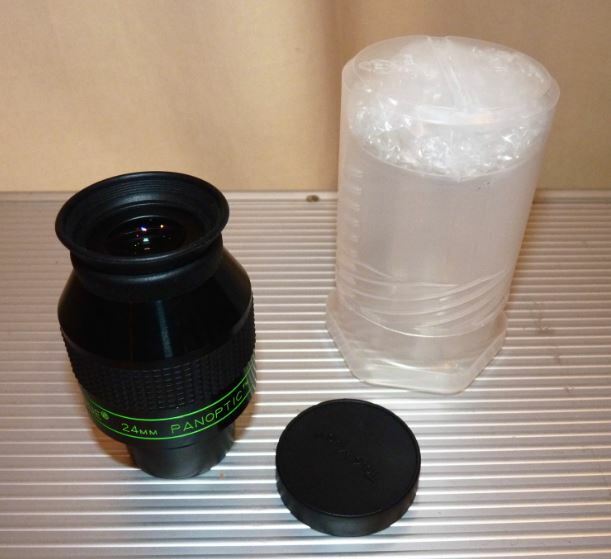 Then I will have to decide if shifting to 20mm ER eyepieces is my best solution. I got a cheap set of readers from the drug store that have a spring-loaded temple piece. They fit OK when I have only a cap on, and they spread and pinch in so I can actually wear them on the outside of a down parka hood. I keep them on a lanyard around the neck and they go on and off my head 200 (or more) times a night (at least). I can do it with one hand, but one could reasonably ask why I don't observe with glasses on. 2) my eye is deepset enough that, with glasses on, I'd need at least 20mm of Effective Eye Relief to use the eyepiece comfortably, and even 20mm eye relief eyepieces don't have that. 3) I like to roll my head over and look at the edge. Very difficult to do so with glasses on. 4) No eyeglasses I've ever seen are completely free from distortion, chromatic aberration, internal reflection, or simply "aberration zones". I've only owned about 60 pairs of glasses so far, and that's my experience. Maybe yours is different. Image quality ALWAYS suffers when using glasses. I'd put up with that if I had to, but I don't have to. me to see the entire field. How in the world can 1 plastic lens, even with elaborate coatings, cost as much as a Paracorr, with 5 multi-coated lenses in a CNC-machined, anodized, aluminum housing? Highway robbery. So, on and off my face they go a couple hundred times a night. I've been doing that for the last 30+ years of observing, and I don't even think about it any more. So careful--20mm of eye relief may not be quite enough to view with glasses on. Edited by Starman1, 28 May 2016 - 12:21 PM. to paraphrase your response: GET OVER IT. that is probably the best solution. Apologies to Markus for steering this thread off course. Nice custom work on the P24 Markus! Edited by Kunama, 28 May 2016 - 05:18 PM. Some history of the Panoptic line below....I think I'm going to add the 22mm Pan to my collection and keep the 24mm as well. It's time to keep BUYING and stop SELLING. I preferred the 22 Pan over the 24, due to its eye relief, which is very long if I recall. I used mine with a Dioptrx, which is useless on a Pan 24. The 22 is not as well corrected though. I did not get to test it with a Parcorr, which I've heard cleans it up nicely. My ultimate solution was a N22T4 (with Dioptrx). Way back when I sold a 19 Pan to a local fellow who started a thread on astromart (back when the AM forums had more traffic) wondering what was wrong with the eyepiece I sold him. It was his first wide-field eyepiece and I didn't discover the thread till a few weeks later when after many responses the conclusion was he was seeing the coma in his primary mirror for the first time. I had a SCT at the time and it performed admirably. Before he realized it was coma all kinds of speculation was offered from selling a bad eyepiece to taking the Pan apart and putting the lenses back in wrong. My point? A coma corrector it a valuable piece of kit that makes your newt perform like a really big APO. Have you ever tried one Mark? I can't use my f4.3 scope without it and stars are pinpoints to the edge of even 100º eyepieces. Edited by JimMo, 31 May 2016 - 10:32 AM.